There have been three Under The Covers albums so far… how come you’re so into cover versions? Everybody loves covers. Musicians are generally obsessed with music, and so the chance to do some beloved songs is an incredible experience. Even when we were with The Bangles we would do droney, reverb-drenched covers of Beach Boys songs. I think it’s part of the process of figuring out who you are as musicians. 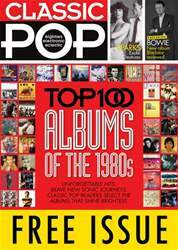 Which decade did you prefer doing covers from: the Sixties, the Seventies, or the Eighties? The Sixties have always been the touchstone era for everything and really formed The Bangles’ sound, and I still listen to Sixties music every day. I’m painfully unaware of what’s been going on since the Nineties. I lived through the Eighties as a musician, but I’m so entrenched – and I’m not necessarily proud of it – in the Sixties that it’s often prevented me from knowing about other things. That said, both Matthew and I were taken by surprise when we realised how essential the Seventies were to us. It was such a diverse era.